Tip the bread mix into a bowl and add the herbs, pepper and 320ml lukewarm water. Mix to a dough with a round-bladed knife. Turn out onto a lightly floured surface and knead for 5 minutes (or use a mixer with a dough hook). Place in a lightly oiled bowl and cover with clingfilm. Leave to rise in a warm place for about 45 minutes, until doubled in size. Tip out onto a floured surface and divide the dough into 8 pieces. Roll each to a naan-shaped oval, measuring about 22cm in length. Cover loosely with a tea towel and leave to stand for 10 minutes. Melt the butter in a small pan with the olive oil and stir in the garlic. Lay half the dough pieces over the hot coals and brush with a little of the garlic butter. Cook for 1½ -2 minutes until the underside is golden. Flip over the bread and cook until golden. Scatter with sea salt and stack up on a plate while cooking the remainder in the same way. 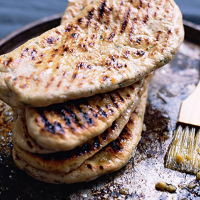 To cook indoors, griddle the bread, one portion at a time, until golden on each side, brushing with the garlic butter as above.